Faye Gibbons is an old pro at children’s and Young Adult writing. An Auburn graduate and author of more than a dozen books, she won the Georgia Author of the Year award in 1983 for Some Glad Morning and the Alabama Author Award, given by the Alabama Library Association, for Night in the Barn in 1998. Often compared to Laura Ingalls Wilder because of her plucky and beleaguered girl protagonists, Faye Gibbons can also be usefully compared to Robert Morgan, especially his Gap Creek novels. Closer to home her work resembles the work of Kerry Madden of Birmingham and her Appalachian series featuring Livy Two of Maggie Valley, North Carolina, whose dream is to play music professionally, finally at the Grand Ole Opry. In a recent conversation with Kerry Madden, I asked if there was a process or system to her YA novels. Yes, she told me: put your heroine up a tree and then throw rocks at her. 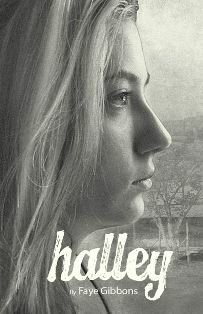 In the first chapter set in July 1936 at fictional Alpha Springs near Rome, Georgia, we learn Halley’s beloved father, Jim Owenby, has been killed in a truck accident helping some moonshiner kinfolk, and Halley, 14, her mom, Kate, and brother Robbie, 6, are destitute. They have to leave their home and friends and move in with Kate’s parents. Pa Franklin is a religious fanatic, cruel, hypocritical, miserly, and mean. He takes all proceeds from the sale of the Owenbys’ place and will not even let Robbie keep his beloved old piano. When the heartbroken family arrives at Franklin’s farm his first order, unforgivable, is to have Robbie’s dog Buck killed. He’s too cheap to feed a dog that won’t work. She yearns for school, and should be in the ninth grade, but doesn’t get to go. Halley hears of Martha Berry’s school in Rome, Georgia, run for poor mountain kids as a work-study coop, but Franklin is against all education. He doesn’t even want his son Gid to learn a trade at the CCC camp. Farming is the only respectable job for a man. For women: wifery and child bearing. Her mom finds love, Uncle Gid finds love, there is a rebellion in the house, and Pa Franklin is humiliated.